Disney World sets Princess Elena of Avalor meet and greet start date. 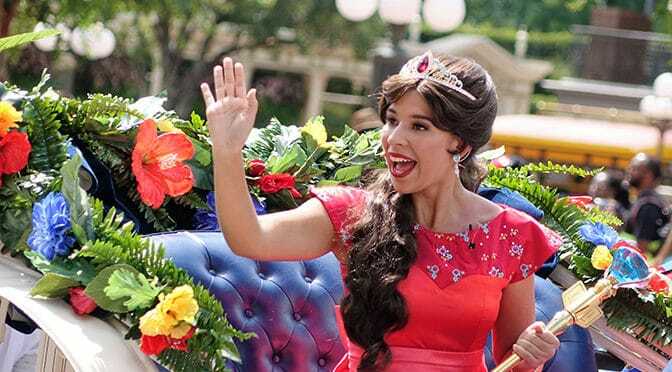 Begining November 24, Princess Elena of Avalor – Disney’s first Latina Princess will begin meeting guests at the Magic Kingdom. She will meet alongside Cinderella in Princess Fairytale Hall. Rapunzel will continue to meet in the other queue along with Princess Tiana. It is expected that Princess Aurora will move to the porch area of the Town Square Theater. That is the outside exit area after you leave from meeting Mickey or Tinker Bell. You can begin to reserve Fastpass+ now (October 14) for Dates from November 24 or later, if you are an onsite guest. Looks like the delay in releasing Fastpass+ for Town Square Theater was all about this edition. It is expected that the Princess Elena Royal Welcome that is performed on Cinderella Castle stage will end on November 23. I can’t find where to meet Aurora in the parks! She moves around so much I don’t know what info is accurate. Now that Elena replaced her in Fairytale Hall, where did she go? “It is expected that Princess Aurora will move to the porch area of the Town Square Theater.” Did this end up happening, because you don’t have her listed in the Magic Kingdom Character Locator? And is she still in France, too? The Disney site has no results for her at all. Is she signing or just photos? Yay! We scheduled a fast pass! Awesome heads -up KTP !! Just got a FP for 11/26 — my kids are gonna freak !! Thank you Kenny, my daughter is going to be thrilled!! KtP you are the BEST! I was able to modify my fast pass to allow my daughter to meet Princess Elena, who she adores. Thanks for all you do and keeping us in the loop! I love being in the know! Is there a schedule of her show on stage? Where could I find this? Would she meet there on nights of Christmas parties too? Unknown at this time. They usually put Princesses with Princes in there. I’ll update MVMCP info when I know. Doesn’t snow white meet outside town hall currently? Love your site Kenny! With your insider knowledge of all things Disney, is there “any” chance that Elena could show up in Fairy Tale Hall unofficially before Nov 24? Heading there for Nov 8 and 9, it would be the best surprise ever for my daughter. We’ve got FP for both the Cinderella and Rapunzel meet and greets. Thanks again for all you do to help folks like me plan the best Disney vacations ever! She pops in from time to time for training, but nothing you could plan around.